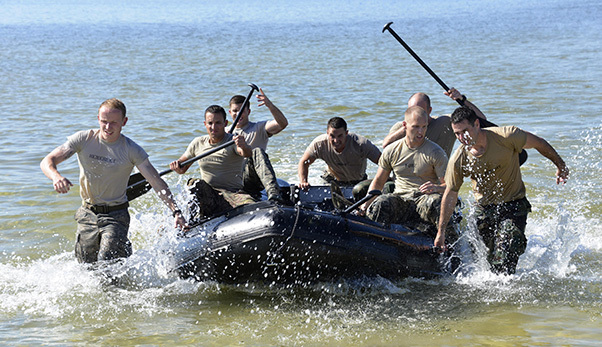 Special Tactics officer candidates pull a Zodiac boat to the shore during a selection at Hurlburt Field, Fla., Oct. 21, 2014. Special Tactics career field training pipelines are some of the most physically and psychologically challenging in the Air Force. To ensure the correct individuals are on the battlefield, a group of Special Tactics Airmen weed out the cross-training candidates who don’t meet the high standards, putting them through a week-long selection process to select only the best-qualified individuals. 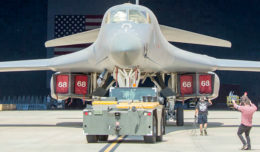 In a move to meet the high-demand signal for the Air Force’s Battlefield Airmen, the service announced changes to retraining and cross-flow, outlined in a policy memorandum dated April 25, 2016. The changes allow airmen to be released from their current jobs in the Air Force to cross-train into the Special Tactics career fields, should they be selected following an assessment of physical, mental and psychological attributes. The memo applies to all Battlefield Airmen career fields, which includes both conventional and Special Tactics Airmen. The critically-manned career fields for Special Tactics are Special Tactics Officer (13CX), Combat Rescue Officer (13DX), Combat Controller (1C2X1), Pararescue (1T2X1), and Special Operations Weather (1WOX2). This change also applies to both Tactical Air Control Party (1C4X1) and Air Liaison Officer (13LX), but these conventional career fields must first serve as a conventional force before applying for Special Tactics selection. An Airman from the 22nd Special Tactics Squadron climbs into a U.S. Army CH-47 Chinook during helo-casting training operations off the coast of Hawaii. The five-foot ocean swells provided the operators with a challenging environment. Special Tactics Airmen are the Air Force’s ground special operations force, integrating air power in ground special operations missions. Specifically, Special Tactics Airmen enable global access, precision strike and personnel recovery operations. The memo reads: Due to unique challenges in finding Airmen who can meet initial qualifications to retrain or crossflow into critically-short Battlefield Airmen career fields, any Airman who meets initial qualifications will be released from their career field to pursue retraining regardless of manning levels within their current career field. 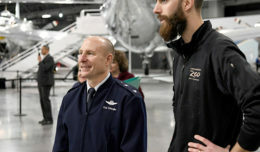 In the event the Airman does not pass further initial qualifications – such as the assessment and selection process or failure in the Battlefield Airmen training pipeline – they will be reinstated into their prior career field without any prejudice. The Air Force does not anticipate significant impacts to any one career field, as the number of Airmen selected for Special Tactics are minimal. However, while only small numbers are anticipated, this new policy could greatly impact the Special Tactics manning and mission capabilities in the future. 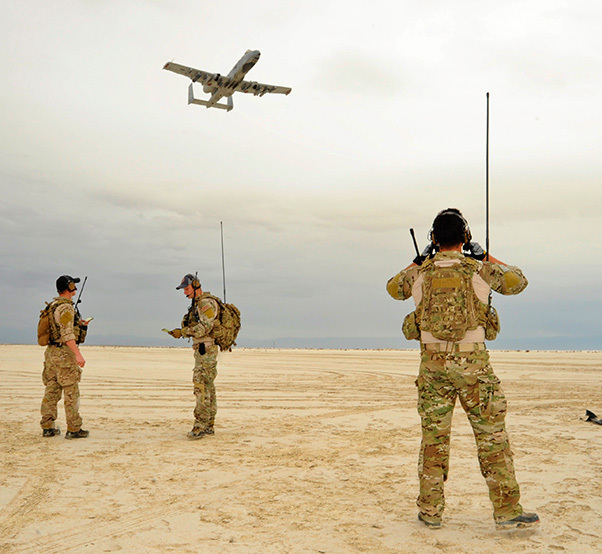 U.S. Air Force combat controllers from the 23rd Special Tactics Squadron, Hurlburt Field, Fla., perform air traffic control radio transmissions to an A-10C Thunderbolt II pilot of the 354th Fighter Squadron, Davis-Monthan Air Force Base, Ariz., approaching an austere landing strip during training at White Sands Missile Range, N.M., Dec. 4, 2014. The combat controllers set up the landing strip as part of their initial and reoccurring training. “We need the right people who can meet or exceed very demanding standards; with this policy shift, there are some highly-qualified individuals in the Air Force who can now apply for Special Tactics assessment and selection,” said Col. Michael Flatten, vice commander of the 24th Special Operations Wing, the sole Special Tactics wing in the Air Force. Airmen in combat control, special tactics officer, and special operations weather are assessed and selected as Special Tactics Airmen into Air Force Special Operations Command; other Battlefield Airmen career fields include TACP, CRO and pararescue, and are often assigned to Air Combat Command. Regardless of background, all Battlefield Airmen career fields are demanding and difficult, with an average attrition rate of 80 percent throughout initial selection and training. 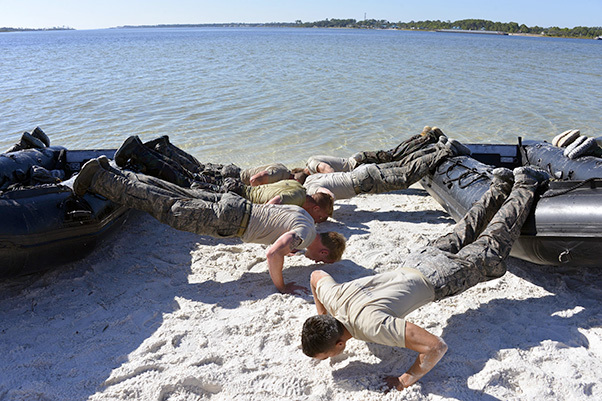 Special Tactics officer candidates perform pushups on a Zodiac boat during a selection at Hurlburt Field, Fla., Oct. 21, 2014. Special Tactics career field training pipelines are some of the most physically and psychologically challenging in the Air Force. To ensure the correct individuals are on the battlefield, a group of Special Tactics Airmen weed out the cross-training candidates who don’t meet the high standards, putting them through a week-long selection process to select only the best-qualified individuals. Cross-training is a force management program used primarily to balance the officer and enlisted career force inventories across all career fields, ensuring sustainability of career fields in support of Air Force mission priorities. 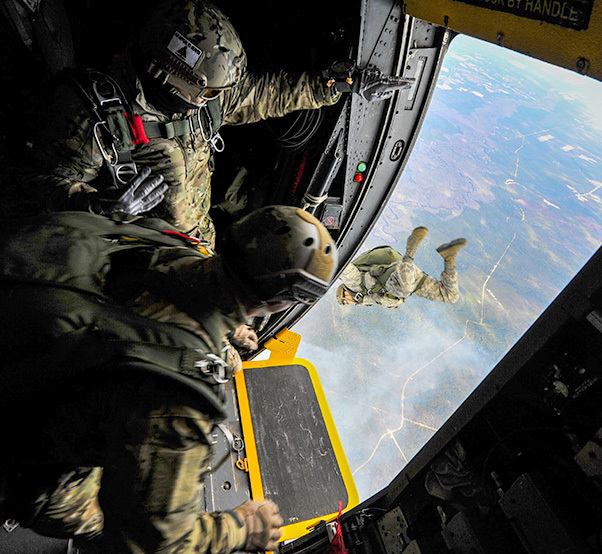 Special Tactics Airmen jump out of the door of a MC-130 Talon II as an alternate insertion into hostile or austere environments, when aircraft cannot land in enemy territory or rough terrain. The Special Tactics Airmen train to land safely in a planned drop zone and conduct their mission, whether it be personnel recovery, airfield reconnaissance and establishment or special operations air integration. 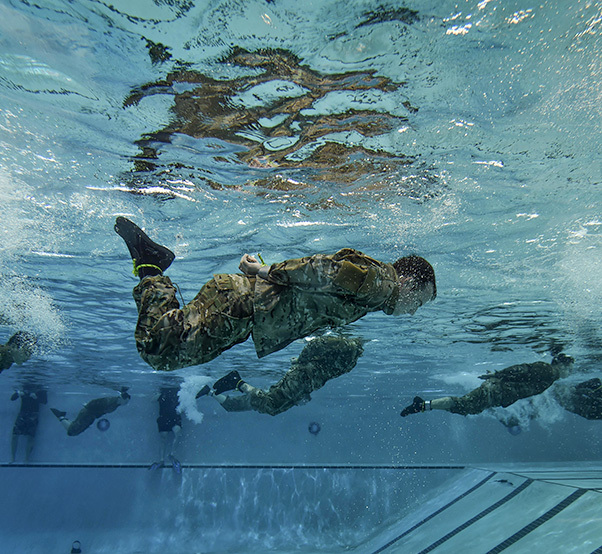 Special Tactics Training Squadron students swim the length of the pool with their hands and feet bound during a pre-scuba class at Hurlburt Field, Fla., June 29, 2016. The training familiarizes trainees with the basics of water operations. The trainees perform tasks such as tying knots underwater, learning how to stay afloat without their arms and hands, and how to use snorkeling gear. 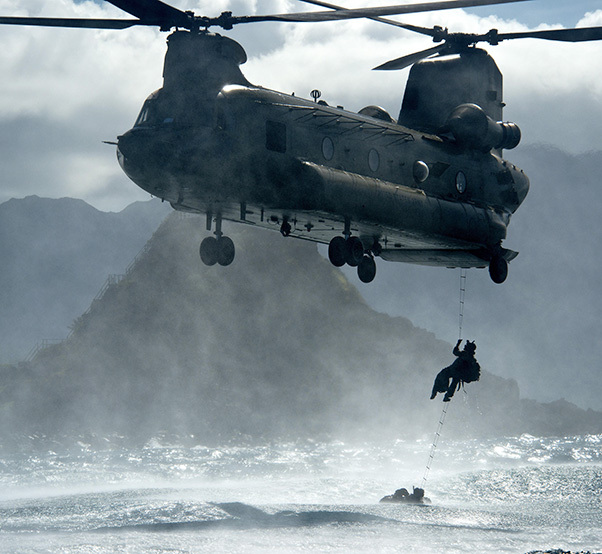 Special Tactics students later apply this knowledge to combat dive training. This training also reproduces physiological effects similar those experienced on the battlefield, and thus builds the necessary mental resiliency for ground special operations force. Special Tactics Training Squadron students perform military freefall training at Eglin Range, Fla., June 3, 2016. 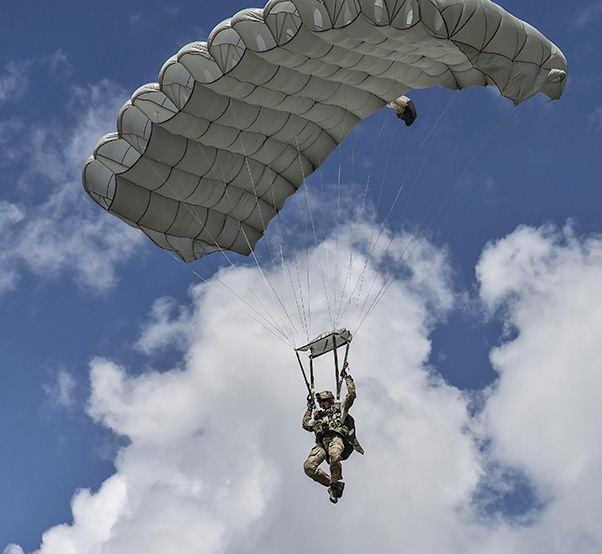 Special Tactics Airmen, the Air Force’s ground special operations force, establish air fields and drop zone for follow-on forces after freefalling in to infiltrate into hostile or austere territory.